As first step he present us a absolutely perfect integrated converter application for android. 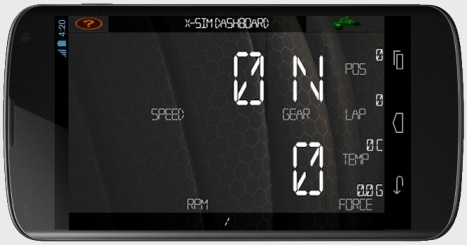 It is a dashboard app for your simulator with easy intallation. It is tested with Nexus 4 (Android 4.4), Bluestacks and AndroidX86 (Houdini ARM Emulator from Intel). As far I got informations a Apple solution is available, perhaps thaparser tell us something more in the below comments. Scan the QR code with your smartphone, you will get to a browser which will download the apk file for you. If you do not know how to scan a QR code you can also press this lame link to download the apk in your mobile browser like firefox or chrome. In the drawer you can touch the file and install it. For the installation you must enable (if not already) the installation from 3rd parties in the android smartphone menu as shown in the next picture (settings button on home screen). After you install the app you start your X-Sim Extractor on your desktop computer. If you are a newcomer follow our installation guide for the extractor: Link .You need to login with your smartphone to your local WLAN if not already done. The app will register itself at the running extractor as a new found converter. You can run as many converter applications as you like. There will be a popup that will ask you to set this converter application as first converter application. If you do only use X-Sim for this gauge application you can answer with yes. If you have another converter running for your simulator you press no and accept the next question with yes. In the first case you have the converter IP in the main dialog, in the second case you have the simulator converter in the main dialog and the android xSimGauge converter in the cluster dialog of the extractor. After this you can simple start your game and the app should display you ingame gauge information. In the rarely case you do not get the popup in the X-Sim Extractor application, you see your smartphone IP address in the running android xSimGauges app on the bottom area. 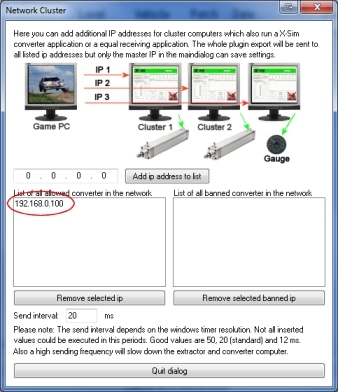 Insert this IP address in the cluster dialog or, if using only one converter, in the main dialog. Try the windows "ping" command to test your WLAN connection from the PC side to the smartphone. If this does not work your router does not support communication between WLAN devices and LAN devices. Sometimes you can enable this again in the router. If you like this app, please feel free to let here a test report (yes it work - I have found a problem etc.) and thank with the thumbs up button in one of the below posts of thaparser (do not vote my post, use the below thanks button). Give some response if you like to see more of this stuff. A big thanks goes to theparser! You see with this app a solution to use the native X-Sim network transfere. It will additionally make a broadcast to register at the X-Sim Extractor as a application that like to get data. There is no need for IP entries or setup. This is available for X-Sim version higher than 3.0.0.9. Another option in this app is using the ingame race detection for additional display. Feel free to make your own apps with this informations, ask thaparser for help if needed. Some legal notice: We are not responsibe for malfunctions, you install the app at you own risk. We have tested the app and scanned it for virus. However this is not a https (not a certified google) server. You can add motion to your video film and generate ride movies. In the best case you own a acceleration logger and you can log your real car ride with video camera and the fitting accelerations with your logger. The video plugin, which you can select in the plugin driver, is able to edit your motion as a standalone program. Import your video and your motion data and syncronize it with each other in length and position. It is also possible to bring motion in your movie films. You can add or edit your own movements with a joystick or with the edit function and the mouse.